When the koi are in Mud Ponds they are litterally living in clay. When we take our koi and put the in an enviornment without clay it is importand to add the correct clay into the pond to provide the koi nutrients and minerals they need. JPD Mud Booster does just that. JPD Mud Booster 22 lbs. 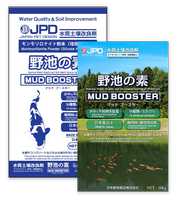 JPD Mud Booster will help improve the quality and health of your koi PLUS helping to keep your pond clean and clear. Will not Clog Pond Filters. JPD Mud Booster 4.4 lbs.